Carrying on our wandering we came to this large stone torii gate at the bottom of a flight of steps. 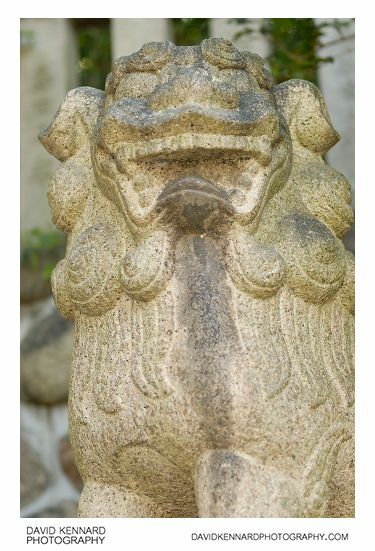 The gate marks the entrance to Oe Shrine (大江神社; Ōe Jinja), and you can see there is also a komainu statue on either side of the gate. Nearby at the bottom of the steps was this painted map, which has small bits of printed paper stuck all over it, presumably showing interesting landmarks (I can't read Japanese). 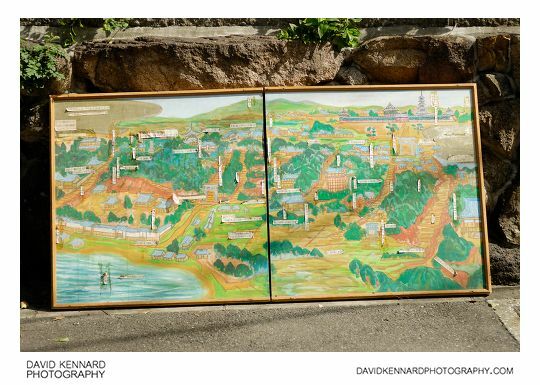 The painting is not of modern Osaka, but I don't know which time period it is meant to represent. At the top left of the painting it says 市内でてんなエエとこおまへんで , but the google translation of this is pretty useless. 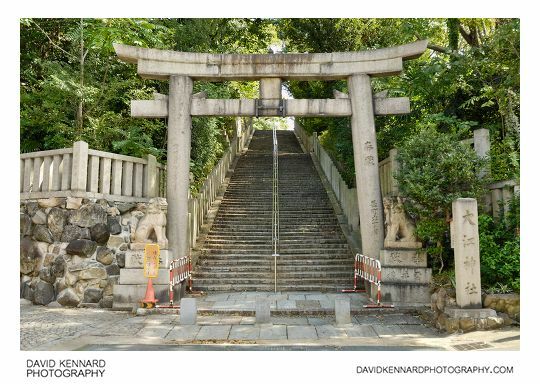 We walked up the steps towards the shrine and about half way up the shrine there was this path off to the left leading a small shrine. There were a couple of barriers in front of the path so you couldn't go and visit this small shrine. 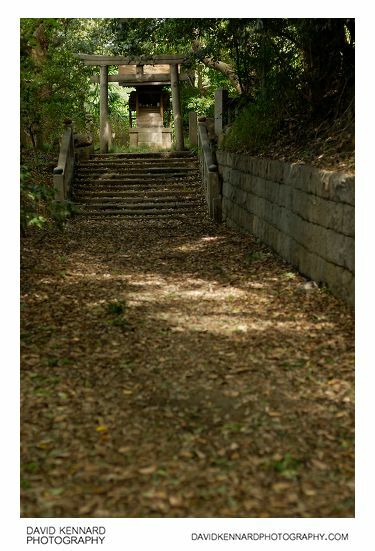 I couldn't find any info about this small shrine, but I did find this photo, which shows some Kanji inscribed into a stone column next to the entrance to the shrine. The Kanji are written in a cursive style though, which makes it too difficult for me to transcribe them to see what they mean. 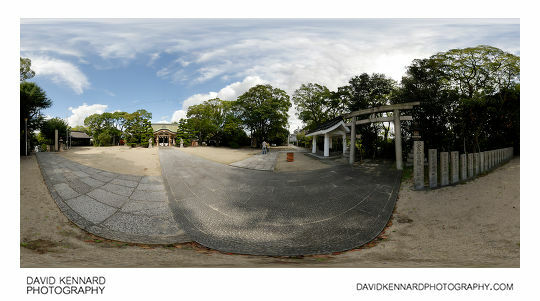 When we got up the steps to Oe Shrine I took a panorama, you can see the 360° version here. The shrine is said to have been established by Prince Shotoku (聖徳太子 Shōtoku Taishi), who is credited with promoting Buddhism and reforming the administration of the country. The shrine is dedicated to the Buddhist god Bishamonten (毘沙門天), one of the Japanese Seven Gods of Fortune. The shrine contains an image of Bishamonten which is said to have been made by Prince Shotoku himself. Apparently the shrine is famous for its tiger statues, which makes it a popular shrine for fans of the Hanshin Tigers baseball team. Unfortunately we didn't look round the shrine much as time was getting on and we wanted to visit Osaka castle. I forgot to take the zenith (up) and handheld nadir (down) shots for the panorama, so I had to manually clone in the top of the sky / large tree and clone out the tripod at the bottom of the image when processing it. This made processing the panorama a much trickier job than if I had remembered to take the shots.